So, it would begin with unity, this new vision. I also think a new vision could appeal to the idea of desire for adventure and fortitude. Kind of an idea of a new frontier. That we are all facing it bravely and we need to do this together and the government should have a role in helping us as frontiers people. So, instead of the great yesterday, as Ryszard Kapuscinski, the Polish journalist, famously said that all tyrants will point to the great yesterday, and we are in fact facing a president who speaks to the great yesterday. He looks at the social codes of race and gender of yesterday. He looks at sources of energy, coal and oil, of yesterday. He looks at jobs of yesterday, big manufacturing jobs. He’s not really preparing us for the future. Instead of the great yesterday, there’s the great tomorrow. We’re unified, you could say, in being frontiersmen, in facing the great tomorrow. That would be getting people computer literate, getting a new army of computer coders, and new training to go on. Actually, the French president, Macron, has said in a recent speech at the World Economic Forum in Davos, that he was going to institute life-long learning for all French citizens. So you could be a 45-year-old mechanic, but you want to be a computer programmer so you can go back to school and the government will pay for it, to learn a new trade. So, the frontier of the future is going to require life-long learning and capacity to switch gears and be socially supported as you learn new skills. To have really state of the art, patient teachers and team building. What’s going to happen to those unemployed truck drivers? Millions and millions. It’s a huge industry. Right. Right. And actually oil rigs that used to take 20 people on a rig in the Gulf of Mexico, they’re automating them, now it’ll be down to five. So, even in the industries that tend to attract Trump loyalists, they’re facing automation and they know it. This isn’t a surprise, but it’s terribly frightening when you don’t reconceive of it as a frontier that we’re preparing for as a country as a whole. Yeah… A few things happened as you were saying that. One, of course, when you say, “new frontier,” one can’t help but think of John Kennedy. That was a shift of generations from Eisenhower, much his senior. Middle of the country, Kansas. Military and post World War II to that shift to young Catholic Kennedy. But I think that the idea of looking at the future as a new frontier places the future in a tapestry that includes a great past for America. We have done very well by frontiers. You tap into traditional American history, traditional American qualities and so on, and the government … I think one could make the case that the government has done a good job of helping us in those previous frontiers. But I was asking myself as you were speaking – does Bernie Sanders? To some extent I think he can’t quite get there because his focus is so much on righting the wrongs he sees that are going on right now. They’d say, “He’s a socialist, we’re a capitalist society. He wants free education for everyone, well, we can’t afford that. Just too much. Comes from somewhere, that money.” So there would be dismissal but then also a kind of a friendliness that he too sees something quite basically wrong. I don’t know how many of the folks you were talking to watched the last debate of the 2016 campaign, but what struck me was – at that point she was favored – but I watched Trump basically say one thing over and over again in the last debate: “She’s been there for 30 years. Look at how things are going. It’s not going to be any different.” No matter what she said, that seemed to me to, if you will, trump everything. We’re going to circle back and get more into the stories that you learned and the stories that you heard and so on in your research and so on, to flesh out what we’re talking about, but we’ve jumped into this question, so I’m going to keep with it. One of the paradoxes that you’re trying to answer is, why do people who need the federal government so much because of the pollution they face and the loss of jobs they face and all of those things, why are they so anti-government? For many of the people you talked with, it’s very clear who the guilty party is, clear who created that sinkhole or destroyed that bayou. It’s private corporations. But they see – the same thing I see – that the government has been bought by those corporations. Yeah, it’s interesting. I have no control, or I feel I have no control over those private companies, but I have a little control over the government. And if I realize that the game is being played on a field I’m not even on, and my tax money is the only thing that I might get out of this – those few tax dollars I’m going to get back, at least give me those. It’s interesting because, as I said – and I believe probably you too – my analysis is the same. When we fault the Democratic party, it’s because they’ve become beholden to the same funders as the Republicans – only they make the case that they’re different. They make the case that they are our protection against those private corporations or against Wall Street, and in fact we see, and these folks down there see, it’s not so much the case. …that Indivisible needs to go for. Hey, we both don’t want bought governments. We want governments who are servants to protect the people. And we want good government. The longer I talked with people in a kind of trusting, open way, the more they weren’t against government per se, they were against corrupt government. The same thing I’m against. Yes, exactly. Yeah, so a lot in common, and there are a lot of people who … I think it’s one out of four people that voted for Trump would have voted for Bernie Sanders if he had been the Democratic candidate. Well now, that’s a group we ought to be talking to about this new narrative. I want to get deeper into the future and into these people and not rehash the election, but I often felt that if you looked around at a certain point during that campaign and saw that there were two candidates who were drawing crowds of 25,000, you’d think, well, those probably should be the two candidates. And it played out that way on the republican side, but not on Democratic side. When it comes down to it – going again to all of your work where emotion is a critical player whatever we may think about social groupings and demographics and all of that – passion is what gets people to the polls. It’s what gets them to get their friends to the polls, and one side had it, and the other side did not. As I was driving to the studio today, I’d prepared the interview and everything, and suddenly this thought came to me that we know that Trump’s victory was very narrow. That it basically was 110,000 voters spread over three rust belt states because of the electoral college. Perhaps the Russian interference and the fake news made a difference so it was a close election. But one thing that’s interesting to me, whatever the circumstances were that pushed those three rust belt states into his column, without Trump’s victory we would still have all these severe ruptures in our culture. We would still have had the need to heal this. We would still have had the need for this new narrative. Not just a narrative. I hope that people understand when you and I are saying that, we’re not just saying an advertising message. We’re saying that you actually live that narrative. That you mean it. And this need that you’re citing – and that I absolutely agree with – of healing these rifts and getting people who need what a good government can bring them to not hate it because it’s been sullied – that would still exist. That’s right. And actually, if Hillary had won, I think we’d still be stuck with this great division. And I think both Hillbilly Elegy [by J. D. Vance] and Strangers would still be relevant because they’re focused on this rift. – without getting the slap in the face. Though even if she’d won, we’d still say, “My God, how did Trump get so many votes?” And we look at your two books as one of the ways to talk about that. Right. Or, why are so many people dead set against her? Why is she being so heavily criticized and unable to rule? I’m not saying I’m glad about his victory, but I am saying that the problems were there. He is a symptom, he is not the cause. I think that’s very wise. I really agree with that. I think that’s an excellent point. And, people are increasingly voting their social class and their region and their gender more than before. So when we talk about healing the divide, we need to get people together who come from different regions, classes, genders, and races, and talk about this new unifying narrative of a new frontier. How would it actually work in reality? How do we want it to work out? We would need to get agreement across these differences that express themselves as party differences, but underneath are differences of another sort. I wanted to make another point about the perception of government. What’s going to be the role of government in this new frontier? Suppose we’re looking ahead. We don’t want the great yesterday, we want the great tomorrow as a unified country. Let’s say we had some leaders that really got behind this, how can we honestly make this work for real? We would have to encounter people’s ideas about government as constraint. A lot of the people I came to know in writing Strangers felt, “We’re regulated to death. These useless bureaucrats are coming in and imposing regulations. What we want is freedom from those.” That was a refrain. It took two forms. One was, well, wait a minute, the government is not regulating the big guys. It’s not regulating the big polluters of Lake Charles in Louisiana, let’s say. It’s not regulating Shell or Monsanto, the big ones. It’s regulating the little guy. You go out fishing and if you haven’t renewed your fishing license, well, he’s going to fine you. That is one kind of thing I heard. Bernie, as you recall, always led with that. Whatever he ended up with, he always led with that. And I think that’s something. But here’s an experience I’ve seen. I’ve worked a lot on environmental issues, and I’m just going to choose that as an example. If you’re making some new landfill rules, Browning-Ferris and Waste Management, the big players, will oppose them, oppose them, oppose them until they’re inevitable. Once they’re inevitable, they’ll write them. Right? By the way, that’s what’s going on with the current weakening of Dodd-Frank. Regulation which was to handle the too-big-to-fail banks ended up hurting some of the community banks, and now what you have is a law… When you raise the limit of bank holdings to the limit that they’re proposing, they may not be quite too big to fail but they will be close. Never mind the individual fisherman. Excellent point. And you know Bob Reich has written a book called Saving Capitalism. The former Secretary of Labor under Clinton, Robert Reich, and it’s an excellent book because it points out that actually we don’t have to be against capitalism. What the right is doing is conflating big capitalism with little capitalism. By empowering the big ones. What is considered the sort of golden age was a time when there were countervailing forces. When unions were strong and government was strong and it was the dynamic tension between those that produced the ideal situation. Sadly it also produced the Powell memo, which ended up producing the power of the right, which has now weakened the countervailing force. Right. So to go back to the new narrative and what the new frontier would look like and how we could do it and unify the country, it would be to pull forward some things from the recent past into the future. Things we’ve lost, things like a real system of checks and balances. In a sense, we used to have unions and government watchdogs counterbalancing big powerful companies, and we’ve lost that balance. In envisioning a future, we need to envision checks and balances. I think when most people hear the term “checks and balances” they think of civics and it being within government. But you’re saying, no, checks and balances actually exist around government as well. That there are checks in our systems – which the unions were, which reform of campaign finance could be, and so on. I think that it may be a bit subtle, but there are so many metaphors for how things thrive when there’s a balance of forces. It might seem silly to say, “But, there are sports analogies.” There’s a reason that all of the major sports league have gone to try to come up with some sort of parity through the draft or through salary caps and things, so that there isn’t just a few top teams that dominate everything. I think that’s a metaphor that a lot of folks can understand. Right. Right. I think that’s right, especially when you think that most of the economic growth comes from start-ups and small businesses. So, the new narrative should say, let’s give them a chance. And, in order to give them a chance, we really need checks and balances to make the positives of that continue. Let me just frame that again for listeners. What you’re saying is that, if government is perceived as regulation and taxes, things that are being taken from you, either liberties or your money, how do you transform that to this notion that government is actually empowering you? Potentially empowering for the good and in service of citizens. I followed around, in my research for Strangers in Their Own Land, I followed around a man named General Russel Honore, who was the rescuer of the victims of Katrina in New Orleans. Four-star general, extraordinary person. He’s now become a big environmentalist and has started something called the Green Army in Louisiana. It’s small and they’re up against the power of oil, but they’re a very brave band of people, and I’ve dedicated my book to them. The reason I followed him around is because I found him such an effective communicator. Now, I’ll give you an example. I was in Lake Charles watching him give a talk to a bunch of businessmen – very, very conservative businessmen. For them, the big symbol was freedom. We don’t want constraints, we want freedom to grow our businesses, freedom to get rich, freedom from onerous government regulations, freedom, freedom, freedom. I thought to myself, “I’ve just listened to a genius.” What he has done is to take their symbol, and he doesn’t oppose that symbol, he stretches it to a new situation they hadn’t thought about. These men love to fish, they love to eat fish, gumbo, jambalaya, they’re big fish lovers. But they hadn’t thought of freedom as the freedom to eat an uncontaminated fish. So he did what I came to call a symbol stretch. You take a person’s symbol, you honor it. You just apply it to something they’re not thinking about. Hey, the government could make me freer by regulating polluters. Yeah, that’s right. That’s right. And there was a time, probably, before that pollution got in there when you were free to get that fish. That uncontaminated fish. And then the freedom of the polluter to pollute took away your freedom and now you need someone to help you get that freedom back. An inviting vision. A compelling vision. An open and inclusive vision, rather than something which seems to say there isn’t room for you. Another way that I think we can employ this symbol stretching that I saw the General doing, is to think about patriotism in a large way. The people I came to know over those five years of really getting to know them, visiting them, going fishing with them, they all loved America, and they all felt extremely patriotic. You saw American flags on a lot of mailboxes. You saw them on clothing. You saw them on motorcycles and trucks, American flags. People felt very, very patriotic. I’ll give you an example. When I would ask people, “Well, what does that mean to you?” One man said, “I’d die for my country. I would lay down my life for my country. That’s how much I love America.” That’s a big thing. That’s really important. In other words, another symbol stretch. You take patriotism, but you say, “Hey, look, we’re really worried about all this dissing of the New York Times and CBS and ABC and NBC.” That’s not patriotic. I think that’s a huge, big symbol stretch we progressives need to make, to reach out to Trump supporters and say, “Look, we’re patriots, too.” And let’s look at the real values that are emblematic of patriotism. In other words, what was the Revolution fought for and what was the vision that the Founders fought for and handed to us? Exactly. Huge piece of it. And a valued and honored independence. And you don’t want just the press that agrees with you. One that’s tricky is the whole separation of church and state. That’s a core value of the Founders that has been lost and interpreted differently and so on. When Benjamin Wallace Wells wrote in the New Yorker about your deep story, he said, and I’m going to quote him, “This story was that America, which was once characterized by hard work was now characterized by cheating. The image that Hochschild chose was that of people cutting in line.” Now, in reading your stuff, I hadn’t seen cheating as such. I saw the cutting in line, but I didn’t see cheating. Going back to the Bush/Cheney era, I had thought that cheating would be a good way to characterize the behavior of Republicans and their wealthy donors. Lying to invade Iraq. Tricking people into signing for loans they couldn’t afford. Gerrymandering electoral districts. Making it hard for people to vote. All of these sorts of things. And I thought, cheating is something which most red-blooded Americans don’t like. What do you think? Could that have been a powerful, a compelling way looking at things? We’re Americans, we don’t need to cheat to get ahead. We’re inventive, we’re hardworking, and so on. And yet they cheat. Any thoughts about the power of that particular concept? Yeah…For our listeners, maybe I should back up and say what a deep story is. And how unfairness fits into it. One of the things I discovered and report in Strangers is that, beneath everybody’s politics, left and right, I think there is a deep story. And this is a book about the Right’s deep story. What is a deep story? A deep story is what feels true about an important, salient situation. You take facts out of the deep story, you take moral precepts out of deep stories, it’s just what’s left. What feels true about something salient. In the right wing’s deep story, you can tell it like a dream, sort of in metaphoric form. Hmm, I see. Yeah, yeah. Waiting in line. At the top of the hill is the American dream. You’re feet are faced forward and the line hasn’t moved in two decades. Actually, the people I interviewed hadn’t had a raise in two decades so they were retiring on less than they’d hoped to. And in this deep story, you’re waiting in line for something you feel you really deserve. You’ve worked hard, you’ve obeyed the rules, and in your mind, you don’t begrudge anyone. You’re a nice person. You go to church. So they saw all of these as line cutters. Then they saw, in another moment of the right wing deep story, the federal government waving at the line cutters. Oh, he’s their president. He’s forwarding their interests and it’s kind of the line cutter country then. And he’s pushing me back. And as the right winger is feeling pushed back, he’s also feeling, “What is there to be proud of?” I can’t be proud of my region. People are saying it’s a backward region, the South and wagging their moral finger at the South. And that it’s a conservative region. They feel their values are not the values of the whole nation now, that they’re castigated as racist and sexist and homophobic. And then they feel, as religious people, that it’s a more secular culture so they’re marginalized in that way. And then they see that actually, as whites, their days are numbered – so they’re demographically marginalized. So, this isn’t necessarily cheating. It’s that it felt to them unfair. Not a self-conscious, “Gosh, I’m going to cut … ” To them, the line cutters didn’t feel they were cheating. They just had a different idea about what the rules were. And so, the point being for those on the progressive side, if you want to understand the minds of people that voted for Trump, inequality and unfairness are not the same thing. I think for a lot of people on the Democratic side, inequality itself seems unfair. Wait a minute, how did this happen? The top 1% own, what? 40% of American wealth, that seems unfair. But to the people I came to know on the right, that wasn’t particularly unfair. But what was unfair, was the idea of line cutters hurting your chance of getting to the American dream. The Left has a different deep story but, I believe, the point of this book is to communicate how some Trump voters see the world, and to point ways we can take it from there. But first we have to understand how they think. Yes. I think that’s unifying. I think they would nod their heads and they’d say, “We don’t think that’s good. It’s not in our interest.” So, for a unifying new frontier, let’s move forward narrative, I think stopping polluters from polluting could very well fit into that. They would go for that. And it’s not that they loved him. No, they saw every kind of flaw. But they forgave those flaws because he seemed to speaking to them. And we can’t ignore that. Right. That is true. I really feel that’s true. And there’s a power to it as well as a dignity. And it helps humanize the listener. It’s not just that you’re giving something to another person by truly crossing what I came to call the empathy wall. It’s that they are giving something to you. You’re deeper as a result. There’s somehow a humanizing that goes both ways. Oh, of course. In other words, if what humans crave is to be seen and heard, it only makes sense that seeing and hearing has to feel deeply ennobling and deeply gratifying. And they let me in knowing who I was and knowing from the get-go that we weren’t going to agree on most things. Hey, I was coming from the outside, from another political bubble, Berkeley, California. So it was extra generous on their part, you know? They saw your t-shirt. They knew where you were from. That’s right. That was the deal. I was completely open with where I was coming from. And that was the marvelous part of it. It became a kind of a joint project. How can we find some common ground here? Or, even if there isn’t much common ground, how can we respect one another? I think there is a pre-political first step the whole country has to take to establish a floor of respect. And then create structures through which we come together and see if we can find strips of common ground. We’re never going to turn into each other. There are basic differences, but we can find on a lot of issues strips of common ground. You and I have been covering some of them. And I think also reducing prison populations. I’ve talked to a lot of Trump supporters in Louisiana, who said, yeah, we need to get them back to work and back into their families and these laws have been draconian. Come on, let’s … For non-violent criminals. So that is, I think, a really big point of common ground. And on renewable energy. There’s actually a woman in Florida who has started the Green Tea Party. She’s Tea Party but she’s green. We’ve got maybe even less than a minute. If people want to join, learn more about what we’re talking about which is this new frontier, this new narrative, this new coming together that begins in respect and listening and seeing, where would you tell them to go besides your book? I would tell them to Google the Bridge Alliance, which is an umbrella group covering some 80 different pop-up groups called like Hi From The Other Side and Living Room Conversations and Making American Dinner Again – where people from different sides get together with a commitment to explore a potential common ground. So that’s BridgeAlliance.us or you can go to the Bridge Alliance Facebook page. Very good. 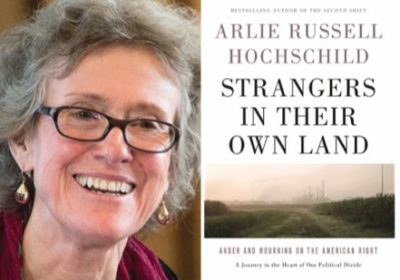 So the website to learn more about Arlie Hochschild’s work would be go to berkeley.edu, and then search for Arlie Hochschild. And it’s H-O-C-H-S-C-H-I-L-D. The book is Strangers in Their Own Land: Anger and Mourning on the American Right. Let me tell you one thing, Arlie. I will confess to how obsessive I am, I had prepared, about 12 pages of questions. And once I asked you basically the first question, which is what’s the new story, how do we do it, I had to throw out most of that. You wrote this book over a five year period. You’ve been talking about it for over a year, and when you had the chance to not have to cover the same ground, you leapt on it. I really thank you for that. Okay. Well, my great pleasure talking to you, Terrence. Okay. So, for this conversation and many other interviews, articles, transcripts of interviews, to join me in pursuit of a world that just might work, go to terrencemcnally.net or aworldthatjustmightwork.com. They’re the same website. If you want to receive a weekly email announcement, that tells you who we’re going to be talking to and includes six, seven, eight articles of relevance, you can sign up at my site or you can email me at temcnally@mac.com. You can find years of podcasts at my site or at iTunes. Listen anytime anywhere. To my listeners, thank you and please share this podcast widely. Thank you Arlie Hochschild, keep up the good work. Well, same to you. Keep up your good work.